COMMENTS Manufactured for commercial sale, but never released due to legalities involved with using the interview. Issued with custom title cover with photos on back. Sleeve list the new B-side. COMMENTS Issued with a 'nostalgic' 1960's label. Issued to celebrate the 20th anniversary of the British release of "Love me do". Identified as a promo only by the prefix "PB". 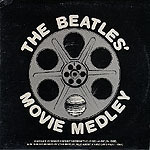 Released for the 20th anniversary of The Beatles arrival in U.S. Produced in limited quantities. This was to be the first single from the aborted "Sessions" album which was shelved due to legalities. This sleeve was the only finished product from the project. A small quantity of 1500 sleeves was found in 1994 which has forced the value down. COMMENTS Purple label with "MANUFACTURED.." perimeter print. COMMENTS Limited edition available only with mail-in offer from Capitol Records in Nov.1992. Reportedly, 5000made. White label with Capitol/Parlophone and Apple logos. Some copies issued with a gray 3"x5" card from Capitol thanking them for responding. Original 9"x12" mailer has Capitol mailing label. 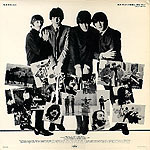 COMMENTS Released for the 30th anniversary of The Beatles arrival in U.S.
Nice replica of the 1964 original thumb tab version. To tell the difference note the oval Capitol logo on the sleeve. "REG. U.S. PAT. OFF." The reissue has the period added. Issued in a clear mylar sleeve with a small round 30th Anniversary sticker adhered to one side with a UPC sticker on the other side.